The number of colors to be used depends entirely on how many colors you can achieve from as few colors as possible. The use of Cyan, Magenta, Yellow & Black (CMYK) which is just 4 colors gives the effective possibility of over 16 million colors available to be printed by mixing these four colors in different strengths. 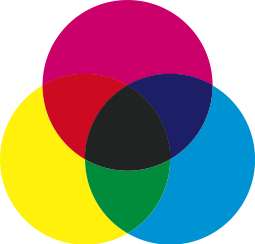 As the black color achieved in the mixing of Cyan, Magenta and Yellow is a very muddy brown color, the printing process uses Black as the fourth color. The examples and the color wheel only shows solid colors here, and when mixed in different strengths or percentages, different shades are achieved. Further black is utilized to darken the color when required. Although this process gives an astronomical array of colors, sometimes the designer or the print buyer requests the use of special or spot colors. Spot colors added to the specturm above of the millions of colors, further enhances either a solid spot or a varying percentage, further making the arrays of possibilities even grander. If there are no special color or spot color requirements, or the images being printed are all color photographs, then CMYK or Process color printing is adequate. The only time it is recommended to use spot colors is when a specific color is required and cannot be compromised, or if there are large areas of a flat color required in the printed piece. The exception to the rule above, as there always is, when the use of metallic colors is made. Metallic colors are available in several golds, silver, and bronzes, and further mixed with pantone colors to achieve a metallized or perlized look to the images printed with the mixed inks. At Printoutlet, we recomment that to keep the price of printing cheap, and mostly for all brochures, shell sheets, business cards, post cards and other printed material - keep the colors to be used down to the four process colors - Cyan, Magenta, Yellow & Black.